At our house, Mother’s Day rules are sacrosanct: Mom doesn’t have to cook, clean or break up any fights. When my sons (now teenagers) were toddlers and my now-silver-muzzled Labradors were just puppies, this was the bare minimum for pampering in my book. And as much as I really do love to cook, the bounty of restaurants serving Mom’s Day brunches and special dinners makes for a delicious respite from household food prep, sibling squabbling notwithstanding. 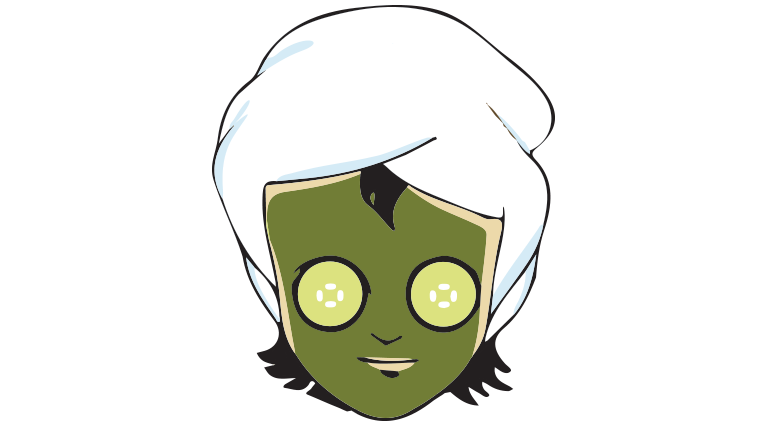 In fact, Mother’s Day is the restaurant industry’s busiest holiday (followed by Valentine’s Day and Father’s Day). Last year, the National Restaurant Association found that 92 million Americans—that’s almost 2 in 5 adults—relied on restaurants for dine-in service or take out on the second Sunday in May. The percentage gets even higher for families with kids under the age of 18, where the industry group notes that 44 percent plan to dine out on Mother’s Day and 13 percent plan on getting takeout or delivery. 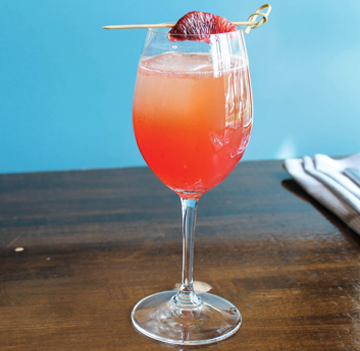 It’s uncertain how much alcohol sales are part of this annual industry mother lode (heh), but it just so happens that most of Utah’s favorite spots have festive beverages at the forefront of their celebratory menus. “I think every mom deserves a toast. And for me, nothing says a toast like bubbles,” Pago Restaurant Group’s Scott Evans says. Read on for some tasty cheers-to-Mom selections from the bustling dining rooms and sunny patios around town. And check out my own recipe for an easy, refreshing tea julep with a festive and sweet flair the whole family can enjoy. “Palomas are just plain delicious, and you may have heard of our obsession with cider,” Scott Evans says of the several rare varieties rotating on the thoughtful East Liberty Tap House menu. 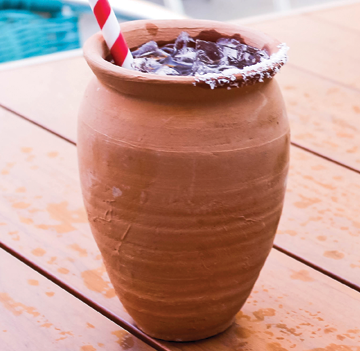 The ELTH patio is also one of the prime people-watching spots in SLC’s hip 9th & 9th neighborhood, which Evans says is a great excuse for Mom to “drink our Paloma riff on the patio and watch the strollers cruise by. Go ahead and put your feet up on an extra chair.” Sounds like my kind of easy Sunday. Pour some kosher salt on a plate. Rub half of the rim of a highball glass or tall Collins glass with grapefruit wedge; dip rim of glass in salt. To a shaker, combine grapefruit juice, lime juice, pinch of salt and simple syrup. Dry shake to combine, then pour into the salt-rimmed serving glass. Gently stir in tequila, add crushed ice to the top of the glass, and top off with cider. Garnish with a grapefruit wedge. Fast forward to the modern era, and variations of Brazil’s national beverage can be found all over the world. 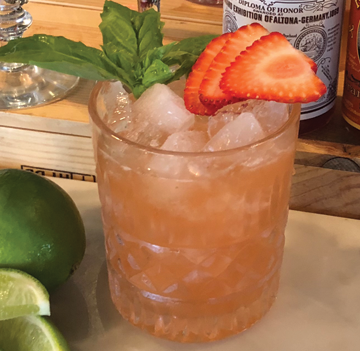 This strawberry-basil caipirinha created by Café Niche general manager Caprice Ossana hits all the springtime high-notes, Brazilian-style. Made with muddled strawberries and basil with fresh lime juice, cachaça and a balsamic reduction, it’s sure to please. And it also goes perfectly with Café Niche’s delectable croque-madame—just sayin’. To a mixing tin with ice, add rum, liqueur and juice. Shake well, then strain into a wine glass with a few cubes of fresh ice. Top with sparkling wine; garnish with a skewered blood orange segment. Being originally from Kentucky, Mother’s Days of my younger years were usually the weekend after Derby Day. Having lived outside the South for so many years, my tolerance for both sweet tea and super-sweet mint juleps has declined precipitously. This news is often received with a “Well, bless her heart,” in side-eyed rebuke when I’m now visiting the Commonwealth. In response to such divisive recipe decisions, I often defer to the DIY model of mixology at my own home bar: Make the base drink and let your guests add sugar to their taste. 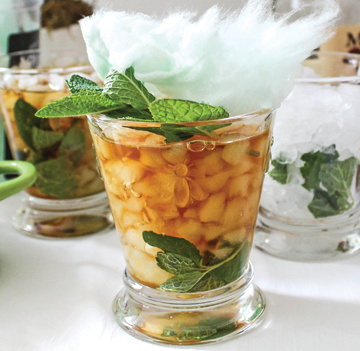 As both sweet tea and mint juleps are basically 2- to 3-ingredient beverages, consider the super fun and kid-friendly option of adding pieces of cotton candy (it’s essentially spun sugar, anyway, right?) to melt into the drink and gradually reach a singularly arbitrary level of saccharinity. Utah’s own Lollipuff Gourmet Cotton Candy (LollipuffCottonCandy.com) even has delectable organic flavors like peppermint, mint limeade and wintermint (among dozens of options) to add flair. Method: Smack a sprig of mint between your hands (in a firm clapping motion) to release fragrance, drop it into the bottom of a chilled silver julep cup or old-fashioned glass. For the grown-ups, add 1½ ounces of bourbon. Fill the glass to the rim with pebble or crushed ice and pour in 4 to 5 ounces cold black sun tea. Add more ice to the rim of the glass and garnish with another sprig of smacked mint. Serve with cotton candy for folks to sweeten to their heart’s content.